The billing for this gig in the South Bank's schedules was just "Marius Neset". The blurb focused on him and him alone, his compositions, his sound, from start to finish. Yes, obviously, he is an important part of the story of this gig, but just that: a part of it. All that interaction, all that spurring-on, the landing of surprises on each other, plus all the prior thought that has gone into varying the textures and the pacings... these led to a completely satisfying evening. I wrote a press release for one of Neset's albums, and he had some interesting thoughts about the mix of contrasting personalities in his group (it's in the seventh paragraph HERE). I found myself constantly marvelling at these players and their speed of reaction. Anton Eger seemed to be able to unleash massive propulsion and huge volleys of rapid-fire commentary and yet he never overpowers or dominates or resorts to any kind of thuggishness. Jim Hart’s switching back and forth from either vibraphone or marimba to percussion pad makes him a pivot, able to reinforce either a melodic line or a groove, and to shift the balance of the music from melodic to rhythmic. Petter Eldh can be forceful and anarchic but also forceful and anchoring, and switch from one to the other – and be delicate too. 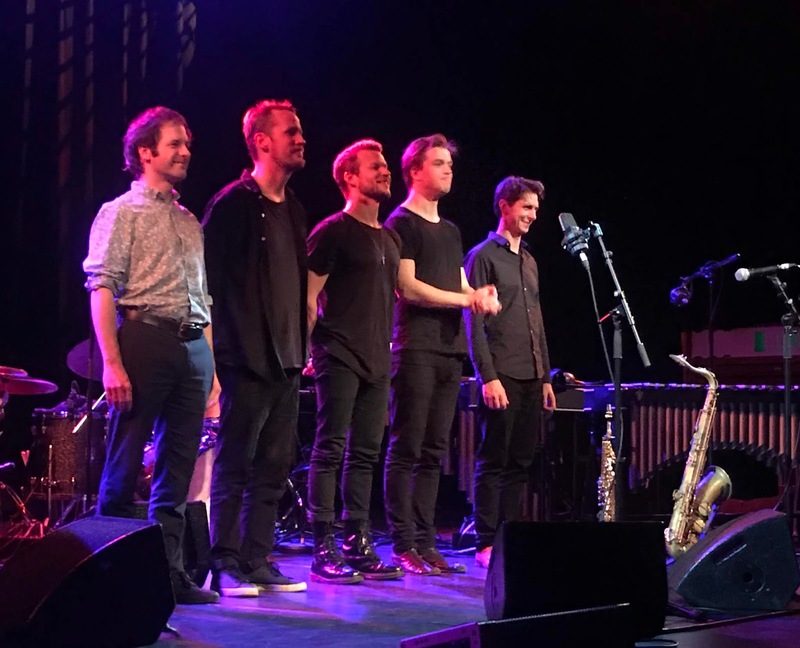 Ivo Neame is one of those pianists who will always spring joyous surprises, and not just for the audience – the expressions of the other band members give eloquent expressions of what is happening. And as for the band-leader Marius Neset, his ability to achieve velocity and be a whirlwind are well-known, but for me it was the melodic clarity and balance from the tune Prague’s Ballet that has stayed in the mind. It's a lovely tune, and he just shaped it beautifully. I noticed that the audience was partly the normal concert-hall jazz audience (yeah, I'll admit, we're getting on a bit...) but the real buzz and the energy in the audience was coming from a substantial contingent of much younger people. A good sign. Perhaps the most complete expression of the reactivity, the mega-energy, the total preparedness of this band was in the closing sections of Life Goes On, where there seemed to be something of a homage to Zawinul's Birdland. This is a band which definitely knows how to make the weather.